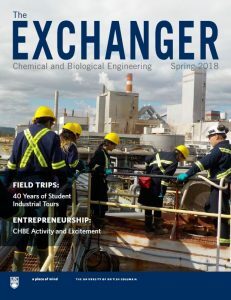 THE EXCHANGER newsletter features a recap of the 2017 year’s faculty research, student achievements, program updates, with a new section on entrepreneurship. If you wish to subscribe for a paper copy, please send your mailing address to newsletter@chbe.ubc.ca. Ingenuity is published by the Faculty of Applied Science twice per year. It includes faculty interviews and achievements, program updates, and the latest news about engineering at UBC.